At the start of the second world war British Intelligence knew next to nothing about German radar development or operatonal deployment. A function as Assistant Director of Intelligence (Science) (A.D.I. (Sc) had been created with professor R. V. Jones as director. Among the many tasks undertaken by this organization was to figure out, if Germany had operational radar systems and if so, how they were deployed and for what operational purpose. The organization utilized all the traditional intelligence methods incl. photo-reconnaissance and intercept and decoding of messages (ULTRA), but also more unorthodox methods like the commando raid on Bruneval was used. In the spring of 1941 A.D.I. (Sc) had identified the Freya and had a fair idea of some employment methods. The Würzburg had been identified, as had the build-up of the "Kammhuber Line", but the workings of neither was well understood. Among the more unorthodox intelligence methods employed were the employment of carrier pigeons. 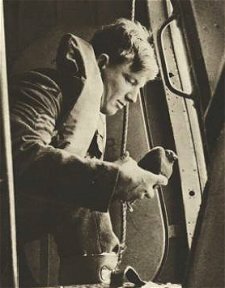 Carrier pigeons have served the military for centuries and they were employed extensively during WW II. Bomber Command aircraft carried 2, which could be released if the aircraft force landed. Intelligence agents parachuted into occupied territory were equipped with carrier pigeons, so that reports could be submitted. Additionally 17.000 pigeons were parachuted into the occupied territory - one in eight made it back. 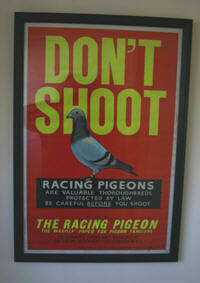 The RAF had experimented with the most suitable way of "inserting" pigeons. Initially they were merely released from an open aircraft door, but it was found that they were "de-feathered" in the windblast and prop-wash and rendered "unserviceable". The pigeons were then packed in thin paper bags and dropped, the theory was, that the bag would be torn or the pigeons would hack their way out. 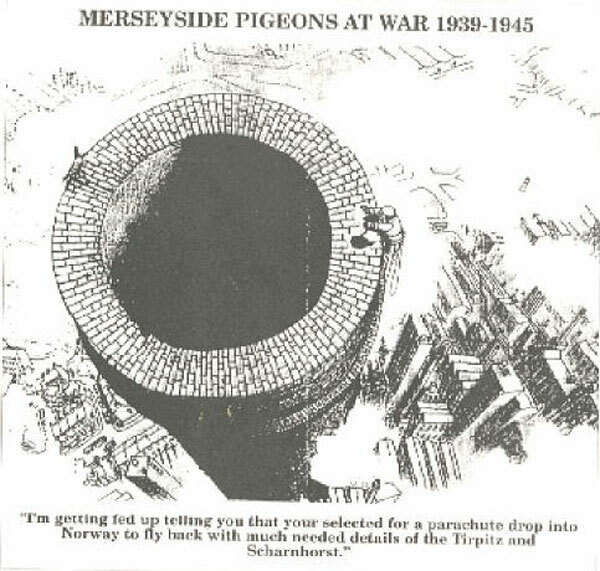 Problem was, that since the pigeons were carrying AND homing, they had no intention of landing on enemy held territory, so they flew straight back to the UK. It was then finally decided to insert the pigeons via parachute in small containers. Pre-mission preparation - the final solution. A.D.I. (Sc) formulated a questionnaire with a number of questions related to odd (rotating) antennas, radio installations etc. 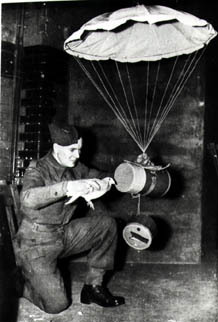 The questionnaire was placed in the pigeons' message container and the pigeons were parachuted into many of the occupied countries. Some pigeons did not survive the drop, some ended up in the oven, some survived, were found by patriots, the questionnaire was answered and the pigeon released. A.D.I. (Sc) was thus informed about a number of hitherto unknown radar stations in 1942 - 43. But some pigeons were captured! The Dickin Medal, bestowed upon animals in the British Armed Forces, who performed extreme deeds of heroism/sacrifice. 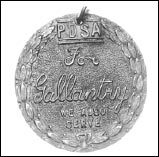 32 carrier pigeons received the medal during WW II. Needless to say some pigeons fell into German hands. And the Wehrmacht reacted with typical German thoroughness. In Denmark a standing order was issued 19 FEB 1942, signed by the Chief of Staff of the German Forces in Denmark, specifying the precise reaction to be taken by individuals and units encountering "enemy carrier pigeons on espionage missions" (Einsatz von Feind-Breiftauben zu Spionage-Zwecken). After proper measures had been taken to ensure that the pigeons survived (they were to be given food and drink before shipment), the captured pigeons were to be sent to collections points and later forwarded to central collection points run by the Abwehr (German Counter Intelligence). The pigeons were then transported to another country, the questionnaire was filled with bogus information and the pigeons were released. Please see below for the wording in the German standing order. It was fortunate that the pigeons could not read German, note para. 5. "lebend gefangen werden" (if captured alive) has a sinister ring to it.